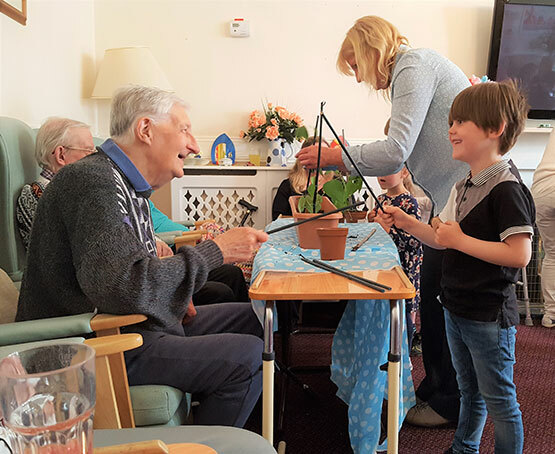 We are delighted that our successful 2018 our Schoolroom in a Care Home pilot project will be rolled out to more care homes and schools in 2019, under the name School Ties. Please contact us if you are a school or care home interested in taking part. 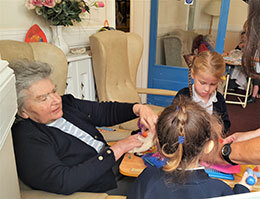 Independent Arts (IA) are behind an ambitious new project, School Ties, that aims to put the Isle of Wight at the forefront of intergenerational care by introducing school rooms in care homes. 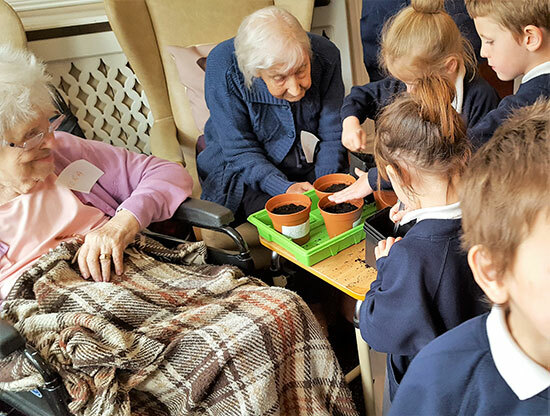 Last year IA ran a pilot project, Schoolroom in a Care Home, where 10 primary school children regularly had lessons in a care home. After just 12 weeks the results were astounding, care home residents felt a range of improvements from increased physical mobility, improved communication and enhanced feelings of self-worth. For the children the results were equally impressive with teachers rating 100% strong improvements in all children over seven criteria including sensitivity, behaviour, confidence and expressive skills. After the success of the initial pilot project, IA have just secured funding from the Big Lottery and will introduce this concept to more schools and care homes across the Island. 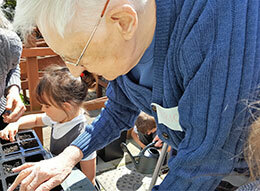 “We will be working with five care homes and schools this year, doubling to ten by 2020. “We know from our own experience and research that this concept really works. The Isle of Wight was recently highlighted for poor adult residential care ranking 47 out of 47 for its residential, nursing and home care services, this was based on the Care Quality Commission (CQC) inspection ratings. Similarly education has hit the spotlight with figures from the Department of Education showing 46 per cent of 16-year-olds failed to pass their English and maths GCSE a figure well below the national average. If you are interested in your school or care home taking part in this exciting project please contact us. 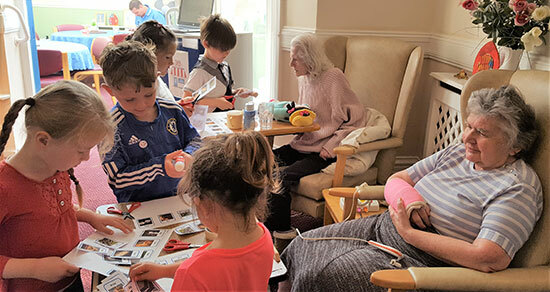 Independent Arts launched a progressive new project running a weekly school room in a care home where school children and homes’ residents learn alongside one another in a highly creative and mutually supportive environment. 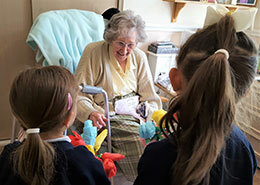 Independent Arts has been developing links with Dover Park Primary School, Ryde, over the past two years, running creative collaborations with pupils from years 2 and 3 and residents from Cornelia Heights residential home. This new project is more ambitious in that it involves a group of Reception-aged children visiting the home once a week for a whole morning of creative lessons alongside residents over a twelve-week pilot period during Spring and Summer 2018. The idea of running a school in a care home is not new one, and some ground-breaking work has already been done in this field in the US. The benefits for both groups are obvious. Not that long ago children were regularly cared for by the older members of their families, and yet today, with more pressures on families, children are increasingly being put into after school clubs and day care settings to cover the gaps. Spending time with the elderly, children learn very early on to be accepting, tolerant and compassionate, all necessary skills for ensuring a caring, inclusive society. They can also be shown new perspectives, and benefit from the wisdom of so many years of lived experience. Similarly, the elderly who are often the most isolated in the community have the opportunity, once again, to play an extremely important developmental role, providing the stability and ballast that children need to feel secure and to develop confidence as they grow up. Independent Arts has put together a carefully devised creative programme for this project across the twelve-week pilot phase. 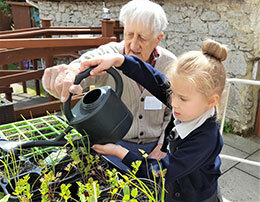 As well as enjoying, lessons in art, music, poetry and story-telling, residents and pupils will be working together on an indoor garden and in their early classes have been learning Makaton sign language together. The early signs are very positive. With such an incredible age range (the youngest pupil being 4 and the oldest being 94) lesson content is a constant surprise. In week one, during a Makaton signing class, resident Ron introduced the children to the V sign for victory telling them that it had been "invented by a very great man called Winston Churchill during WWII". 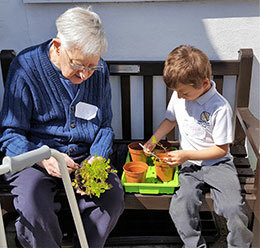 The children and care home residents enjoy a whole range of activities together, from music and movement, art, felt-making, poetry and story-telling, gardening and learning sign language. 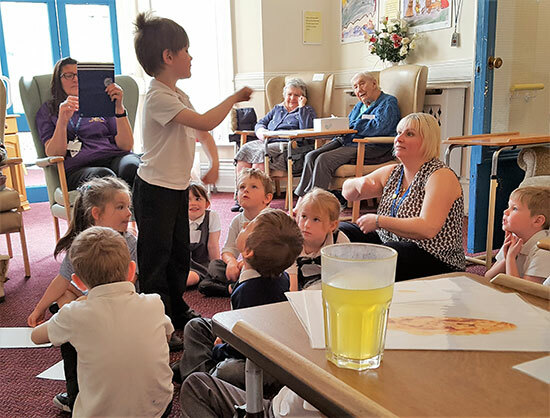 Independent Arts' innovative school room project features in an article on the Carehome.co.uk website (July 4 2018). Read it here.